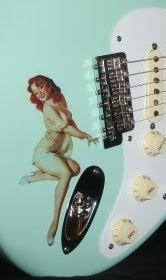 Listed by Eddie Vegas, here's a Strat that's toured the world and seen a whole lot. If only it could talk! This Strat is a Rock 'n Roll road veteran if ever there was one. Original owner Steve Holland was a founding member of Molly Hatchet. Ed really brings in the celeb Strats-- he has listed 2-3 vintage formerly owned by Eric Johnson guitars, among others. FOR NOW, this listing page includes 2 demo videos by Ed the seller, plus a few classic Molly Hatchet performance clips featuring this Strat. Ed is legit-- do your due diligence!